Waterloo – Wilfrid Laurier University will recognize three accomplished Canadians with honorary degrees at its fall convocation ceremonies in October. Recipients include: Ruth Abernethy, known for her lifelike bronze sculptures of figures from Canadian history; Perrin Beatty, president and chief executive officer of the Canadian Chamber of Commerce and former member of Parliament; and Stephen Brunt, award-winning sports reporter, columnist, author and broadcaster. 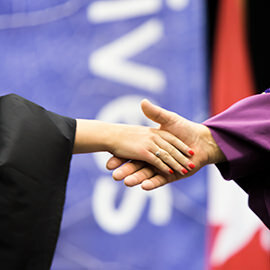 Six convocation ceremonies will be held on Laurier’s Waterloo campus Oct. 26 and 27, and one convocation ceremony on Laurier’s Brantford campus on Oct. 30. Ruth Abernethy is a Wellesley, Ont.-based sculptor best known for her hyper-realistic bronze sculptures. She is particularly well known for her sculpture of pianist Glenn Gould, which sits on a bench outside the Glenn Gould Studio on Front Street in Toronto, and of Oscar Peterson, which is located outside the National Arts Centre in Ottawa. She began her career making props for many of Canada’s theatres, including the Stratford Festival, as well as the Louisville Ballet and the National Ballet of Canada, before launching her solo art career. Since then, she has also sculpted John McCrae, Queen Elizabeth and other prominent Canadian politicians, as well as many private commissions. Abernethy’s sculptures have been exhibited around the world, including in Ottawa’s official residences. Abernethy will receive an Honorary Doctor of Laws Degree on Oct. 30 at the Sanderson Centre for the Performing Arts in Brantford starting at 2:30 p.m.
Perrin Beatty has been the president and chief executive officer of the 200,000-member Canadian Chamber of Commerce, Canada’s largest business association, since 2007. A former politician, Beatty served as a member of Parliament representing Wellington and Dufferin counties from 1972 (when he was only 22) to 1993. In 1979, Beatty became the youngest person to be appointed to cabinet when he was made minister of state for the Treasury Board under then prime minister Joe Clark. He also served as minister of national revenue, solicitor general of Canada, minister of national defence, minister of health and welfare and minister of communications. Beatty was chief executive officer of the Canadian Broadcasting Corporation and the Canadian Manufacturers and Exporters. Outside government and business, he has also served as a chancellor with the University of Ontario Institute of Technology, a visiting professor in the Department of Political Science at Western University and currently sits on the board of directors at Mitsui Canada. Beatty will receive an Honorary Doctor of Laws Degree Oct. 26 at Lazaridis Hall on Laurier’s Waterloo campus starting at 1 p.m.
Stephen Brunt has covered the sports world for more than 30 years as a reporter, columnist, author and broadcaster. He currently co-hosts Rogers Sportsnet’s Prime Time Sports, a sports talk show, with Bob McCown. The show is broadcast on The FAN 590 radio station, as well as online and on television. Prior to joining Sportsnet, Brunt was a sports reporter and columnist with the Globe and Mail from 1984 to 2011. Alongside his journalism, Brunt has authored seven books, including Facing Ali, which was named one of the 10 best sports books of the year by Sports Illustrated, and Searching for Bobby Orr, a No. 1 national bestseller. He is also the founding organizer and artistic director of the Writers at Woody Point, a writers’ festival held on the west coast of Newfoundland every summer. In 2007, Brunt was inducted into the Canadian Football Hall of Fame. He has also been recognized with a Michener Award, two National Magazine Awards, a Gemini Award and three Canadian Screen Awards. Brunt will receive an Honorary Doctor of Letters Degree Oct. 27 at Lazaridis Hall on Laurier’s Waterloo campus starting at 9:30 a.m.
Laurier will also be honouring Bina Mehta, an instructor in North American Studies and Global Studies, with a Donald F. Morgenson Faculty Award for Teaching Excellence, and Jamie Martin, former chair of the university’s Board of Governors, with a Distinguished Governor Award, on Oct. 27 at Lazaridis Hall on Laurier’s Waterloo campus starting at 1 p.m.
Tickets are required for all convocation ceremonies. Contact convocation@wlu.ca for ticket inquiries. For more information about convocation, visit wlu.ca/convocation.